Primula elatior, the oxlip (or true oxlip), is a species of flowering plant in the family Primulaceae, native to nutrient-poor and calcium-rich damp woods and meadows throughout Europe, with northern borders in Denmark and southern parts of Sweden, eastwards to the Altai Mountains and on the Kola Peninsula in Russia. In the British Isles, it is rarely seen outside East Anglia. It may be found near settlements, as far north as northern Norway, after escaping cultivation[clarification needed]. 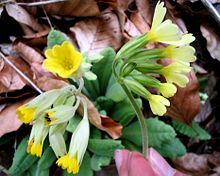 The oxlip is a herbaceous, perennial plant growing to 30 cm (12 in) tall by 25 cm (10 in) broad, with a rosette of leaves 5–15 cm long and 2–6 cm broad. It produces light yellow flowers in spring, in clusters of 10-30 together on a single stem 10–30 cm (4–12 in) tall, each flower 9–15 mm broad. The specific epithet elatior means "taller". The common name "oxlip", from "ox" and "slip", may refer to the fact that oxlips (and cowslips) are often found in boggy pasture used by cattle. 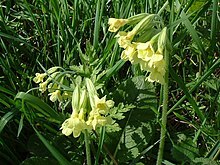 It may be confused with the closely related Primula veris (cowslip), which has a similar general appearance, although P. veris has smaller, bell-shaped, bright yellow flowers (and red dots inside the flower), and a corolla tube without folds. The leaves of P. veris are more spade-shaped than P. elatior. The flower heads on the oxlip all hang in the one general direction, which distinguishes it from the similar False Oxlip, a Primrose/Cowslip natural hybrid, where the blooms are distributed all around the stem. The oxlip was voted the County flower of Suffolk in 2002 following a poll by the wild plant conservation charity Plantlife. Wikimedia Commons has media related to Primula elatior. This page was last edited on 6 May 2018, at 02:32 (UTC).